Spain's busiest fishing port, charming Vigo sits on the rugged west coast of the province of Galicia with a deep, fjord-like harbor. It is clear that the city of Vigo enjoys the arrivals of cruise ships, because the whole port area has been redeveloped and makes a first class impression. Ships dock at the Muelle de Transatlanticos, which is right in front of this fortress city. Just cross the palm tree-lined and very busy Avenida del Castillo waterfront promenade and you're there. The cruise terminal has a few little stores and a WiFi cafe on the first floor. Note: Because this also an important fishing port, seagulls are present everywhere...even on your balcony of your cabin. Galicia's cooler, damper climate has earned it the nickname of "The Green Spain" and made it a popular retreat for Spaniards keen to evade the searing summer heat, enjoy lush country scenery and tuck into some of the world's freshest and finest seafood. For cruisers, this means Vigo is the place to be if you want to experience the "real" Spain, meet the locals and explore an area largely unadulterated by mass tourism. The adventure begins right at the waterfront, whence Old Vigo rises, tiered, to the citadel of El Castro -- one of three, which originally guarded the Spanish city. Samil Sands, just a few miles south of Vigo, is considered the best beach within easy reach of the city. This area offers a vast stretch of golden sands where you can soak up the sun and take a dip in the sea, whilst the estuary gives protection from the breakers. Stroll along the white promenade that stretches behind the beach or relax in one of the many cafeterias that welcome you with ice creams and cooling drinks. The below mentioned hop on/off bus has a stop here. The brand new tourist office is right across the cruise terminal. This is also where the ferry tickets are sold. There is a hop-on-hop-off bus service from the pier head, but it is very infrequent. 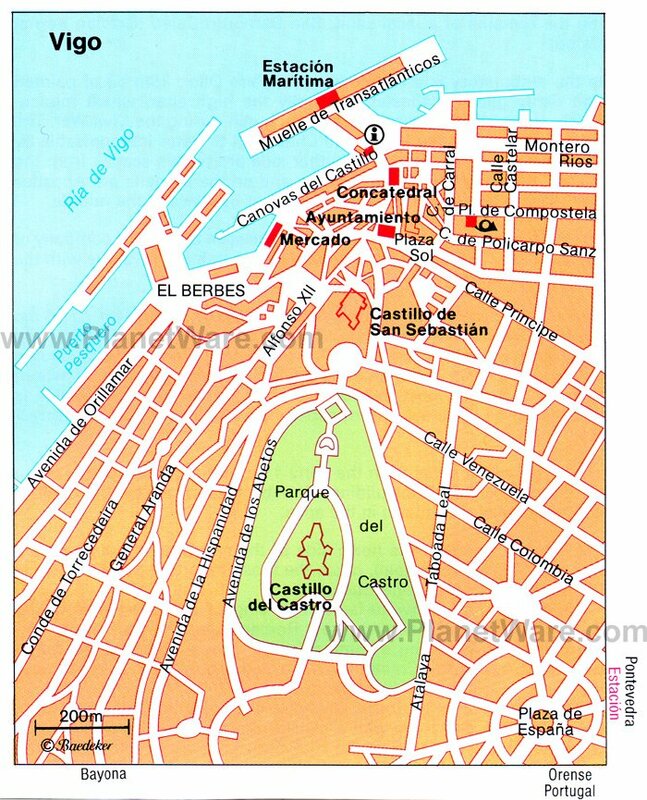 A good alternative is to take bus C1 which takes a circular route through the city. The stop is on the main road across from the tourist office. Pay the driver 1.24 Euro in cash for a single trip ticket. Taxis gather at a rank just outside the port gates and all are metered (look for the green light which signals they're free to pick up a fare). 5 Euro to town. 85 Euro round trip to Santiago de Compostella plus waiting time. Another option is to take the ferry to the small but relaxed town of Gangas across the bay from Vigo, a 15 minute trip, every 15 minutes for about 4 Euros return. The ferry terminal is 100 meters from where you are docked. Tickets are not available on the ferry. Only from the office . The surrounding countryside is pleasant and ships may offer mountain biking and hiking excursions. The world-famous shrine of Santiago de Compostela which was, in medieval times, Christianity's third most important place of pilgrimage after Jerusalem and Rome -- lies nearly 60 miles north of Vigo, while closer to hand (at 12.43 miles) is the pretty fishing village of Bayona, famed for its 12th-century church and a 16th-century castle (now a hotel). Regular boats run to Islas Cíes during Easter Week and summer (from mid-June to mid-September) leaving from the Estación Marítima (port area). A brand new shopping mall has just opened next to the cruise terminal, with Mediamarkt as anchor store, and with large outdoor cafes. Mediamarkt is a large technology and white goods store. Right up from the Bahia Hotel easily visible from the cruise terminal is the cute little old center of Vigo, with little stores and many outdoor cafe's. One part of this street is called Oyster Alley, where one can buy shucked oysters and consume them on any of the outdoor cafe's. Free Wimax(WiFi) is available in this area. For wheel chair users, use the elevators in the shopping mall next to the cruise terminal and use the elevated walkway to reach the above area, and no stairs will have to be negotiated. Spanish is the official language in the entire national territory. However, other languages coexist with Spanish in certain regions of Spain. These are: Catalan in Catalonia, Galician in Galicia, Euskera/Basque in the Basque Country, Valencian in the Valencia Region and a particular variety of Catalan spoken on the Balearic Islands. WiFi: Please see above sections. Emergency number: Dial 112 free of charge (valid throughout Spain). Service is given in Spanish, and also in English, French and German in some tourist areas. The most common business for shops and businesses hours are Monday through Saturday, from 9.30 h to 13.30 h, and from 16.30 to 20.00 h.
Big shopping centers and department stores open from 10.00 h to 21.00 or 22.00 h uninterruptedly. These big stores open sometimes on Sunday. Pharmacies open from 9.30 to 13.30 h, and from 16.30 to 20.00 h. In all major cities you can find pharmacies that open 24 hours. Pharmacies follow a rolling late-hour schedule, which is published in the newspapers, and is posted at all pharmacies. Museums are in general closed on Mondays.